Like many of the systems in Pokémon GO, it can be a little tricky to know exactly the best way to use it. Pokémon Go’s September update adds the ability to have a Buddy accompany you everywhere you go. The buddy system is now adding both new functionality and character to the game. Yesterday, everybody in Singapore received access to patch 1.7 for iOS and 0.37 for Android. 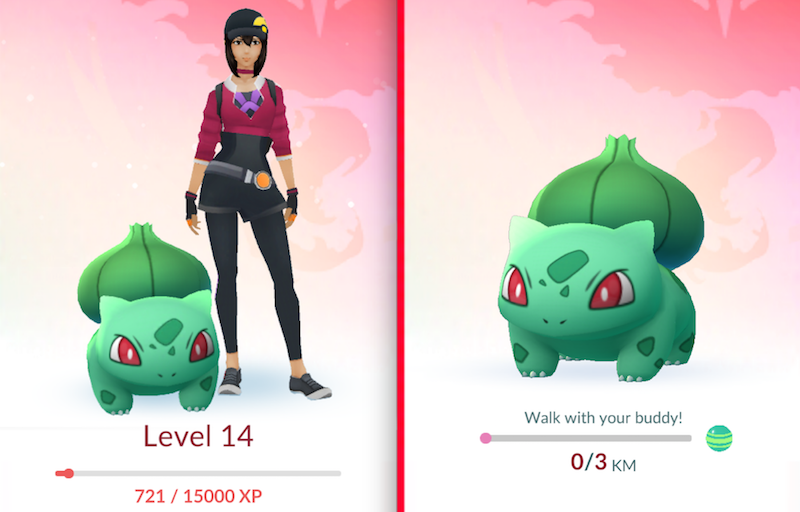 Now, when you walk around and collect Pokémon, you can choose a “buddy” Pokémon that acquires candy of its Pokémon type after you hit certain distance benchmarks. This new feature allowing you to better imagine those adventures out in the world, traversing the wilderness with your faithful Pokemon at your side. Through the Buddy System, players will be able to select a Buddy Pokémon and collect candy as they walk with the Pokémon that they selected, in addition to unique in-game rewards and experiences Mr. Ketchum’s bonds with Pikachu in the anime. Doing this allows you to collect candies for your buddy Pokemon as you walk — it’s meant to address the problem of not being able to evolve Pokemon without being able to find a huge number of wild creatures. So, every time you hit a certain distance checkpoint for your given Pokémon, you get rewarded with a candy. I’m starting with Pikachu, obviously. To activate it, tap on your trainer profile picture in the lower left hand corner of your screen. Tap on the three little bars in the lower right, and then tap “buddy.” This will allow you to open up your list of Pokémon and select one to follow you around. Along with the new buddy system, Pokémon Go’s latest update “made it easier to select smaller Pokémon on the screen,” fixed an issue where eggs hatched without an egg-hatching animation and added support for Pokémon Go Plus, a wrist companion accessory that lets you catch Pokémon and collect items without using your phone. Some players have also reported occasional double candy pickups though. Different Pokémon require different amounts of distance to collect candies for, however. The easiest Pokémon (like my Pikachu) require only 1 km per candy, allowing you to make pretty hasty progress up to your Raichu. The toughest Pokémon require 5 km per candy, though most (if not all) of these seem to be single evolution Pokémon, so those candies will be going to training rather than evolution. The system seems designed to work with the starter Pokémon Charmander, Bulbosaur and Squirtle, all of which are pretty hard to evolve naturally and take 3 km per candy. You can find a full list of buddy Pokémon along with how far you’ll need to walk for a candy here. Pokémon that are already in their final form of evolution with maximum CP should not be selected as Buddy Pokémon, as there would be no use for the candy, unless you have another Pokémon of the same kind who would benefit. Buddy Pokémon should be a Pokémon that the player is looking to evolve or power up or a rare Pokémon that were caught a few times but were not seen again, as the candy that the Buddy System will collect for these Pokémon will help them become much stronger. And that’s how you use the buddy system. I’d recommend using it for the rarest evolvable find you’ve got, whether that’s Abra, Pikachu or whoever. It’s much closer to the “fitness app” side of things and less towards the “game” side of things, but maybe it will allow me to finally get my Gyrados. Finally, that is, after several hundred kilometers. It’s a feature that’s begging for better distance tracking or a Pokémon GO Plus band with a pedometer (still a bit unclear, on that count).